Where am I talking about? The branch of the Sejour Fujita chain of business hotels located right in front of the Funairi-machi streetcar stop. Big deal, you may say. A business hotel? Who cares? Ah, but you will… Because this hotel has recently converted its third and fourth floors into the latest and most advanced capsule-style rooms. Sure, Hiroshima has a couple of other capsule hotels, but they’re located in Nagarekawa drinking area and don’t sport the newest model of capsule. The third floor is exclusively for men and the fourth is women only. 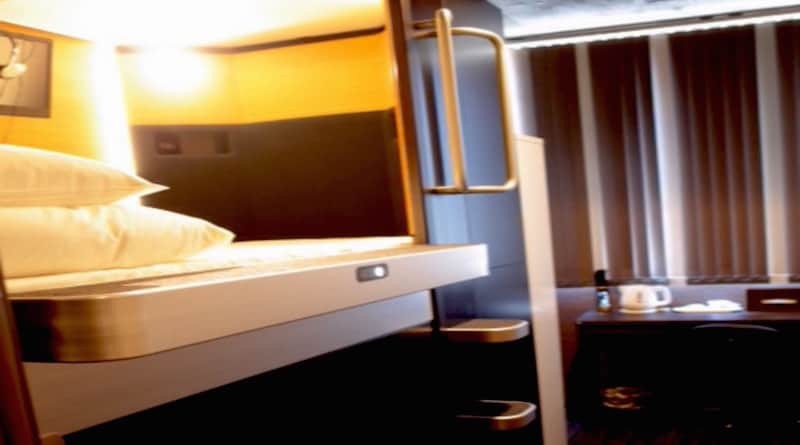 Both have 18 capsules: 10 regular ‘beehive’ style capsules that people familiar with capsule hotels will know, and 8 private rooms which include a desk and plenty of room for baggage and to hang up a suit. There is also a private shared room with two capsules on each floor for those travelling with a companion. Think of a sleepover, but more fun! The hotel is extremely modern with different colour schemes for the male and female floors. Each capsule contains a light, a clock and radio as well as a TV and headphones so you don’t disturb others and they won’t disturb you. A pull-down blind shuts you off from the outside world, sealing you in like a cocoon so you can sleep easy and wake up feeling refreshed. The capsules are roomy and big enough to accomodate even the tallest (and possibly… fattest/biggest) foreigner. Each floor also has a common area outside where guests can hang out, read a book, catch up on work or chat to other guests. Three shower rooms and toilets as well as separate wash basins and a locker room are available just as you walk in the door from the elevator. This is separated from the capsules by a sliding door. There is a kitchen which guests can use free of charge to prepare meals on the hotel’s second floor. Sejour Fujita is 10 minutes walk from Peace Memorial Park and downtown and there is a supermarket just a minute away. If you need to do washing, there is coin laundry in the hotel too. On the second floor just outside the kitchen is a dining room and another enclosed common area with vending machines and a small Japanese garden. In the future, the manager plans to hold cultural exchange activities where guests can learn about Japanese life and Japanese culture. The hotel is clean, modern and just a little bit fancy. Plus, the fact that you’re staying in a capsule makes the whole thing like a space adventure. I guarantee kids will love it! Best of all perhaps, is the price. |A regular capsule only costs ¥2500 yen a night and a private room, ¥3500. And a continental breakfast is included! To get to the hotel from Hiroshima Station, you can either take streetcar #6 straight to Funairi-machi or take the local JR train to Yokogawa Station on the Sanyo Honsen or Kabe Line and then catch a #8 streetcar bound for Eba. Get off at Funairi-Machi and the hotel is right in front of the streetcar stop. I may be a resident, but I assure you I will be checking in to check out just what it’s like to stay in the most advanced model of capsule hotel. I can’t wait!